Cut the bell peppers in half and remove the seeds. Place them in a pot of boiling water for 3 minutes. Remove to a baking dish. In a skillet, brown the ground beef. Drain off the grease and add the onions and cook for 1 minute. Add in all the seasonings, Worcestershire sauce, and hot sauce. Stir to combine well. Stir in the tomatoes with juice and cook for 1 minute. Stir in the rice and combine well. 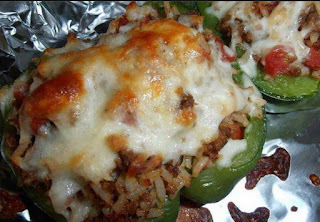 Spoon the mixture into the pepper shells halfway and sprinkle with a little cheese. Fill the rest of the way and mound it on top then sprinkle with more cheese. Bake in a 350 degree oven for 20-25 minutes.